I am really pissed by the fact that my favourite race is continuously underpowered. So much in fact, that i decided that the only solution is… to make my own MMO. I am insane, right? You heard it right. My primary motivation for doing an MMO is to exact revenge in the name of my favourite faction from the otherwise excellent, and almost perfect game EVE Online. You might indeed think i am insane. If you have had anything to do with game development, you might well know that an MMO game is way beyond the reach of a hobbyist developer. There are full articles discouraging indie / hobbyist game developers from attempting an MMO. So wtf, how i am supposed to do it? Well, it is exactly this, and other related things what this blog will be about. Maybe it will be a huge failure, maybe it will be decent, maybe some of you will actually enjoy it at some point in the future. Until that, you are invited to follow me! If you are just a casual gamer, who is into space battles, you might also be interested in following this blog, and this project. Last but not least, here is my great offer: If CCP decides to give all lasers x2 damage, which i believe would be needed to make Amarr competitive, i will officially cancel this project, and re-subscribe to EVE right away! You may already, or may not yet know my game Star Temple TD. It is my first publicly released, more or less serious game. It is a sci-fi themed tower defence, with a bit of unique physics and intense graphics. It is a flash game, with it’s own website, and a server-database, so you can access your data and achievements from anywhere. I had the MMO idea long before Star Temple TD, right after my very first flash game, which was never released. 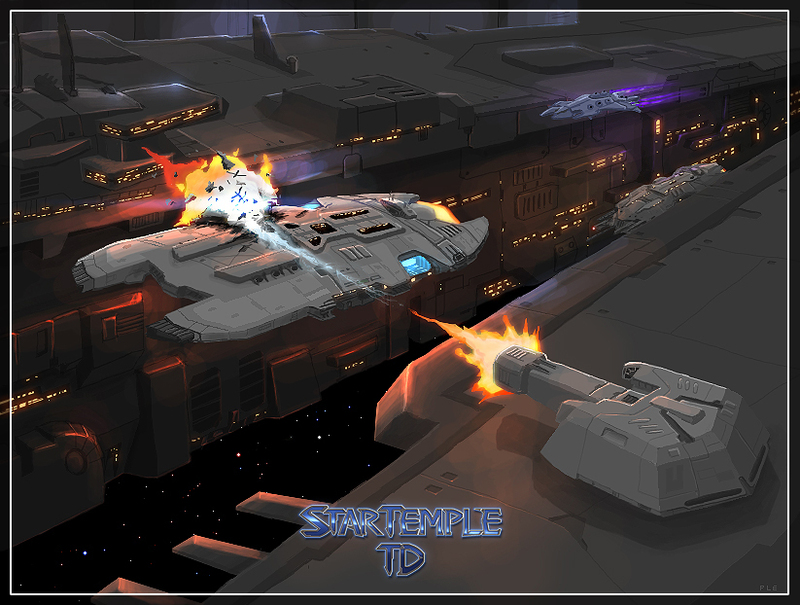 Star Temple TD started out as a little side project, with the engine having been largely done within a matter of a few months. Then i lost motivation, and dropped it for a while, before showing it to a few class mates, who liked it. After a long list of events, the decision was made, to extend it from a stand-alone flash game into a full website, where users have to register and such. Thus, it became a testbed for a lot of technologies, and a huge practice project, partly paving the way for the MMO. If you already know the game, some of the ships, and races are likely to reappear in the MMO, with appropriately updetailed graphics, and proper backstory of course.